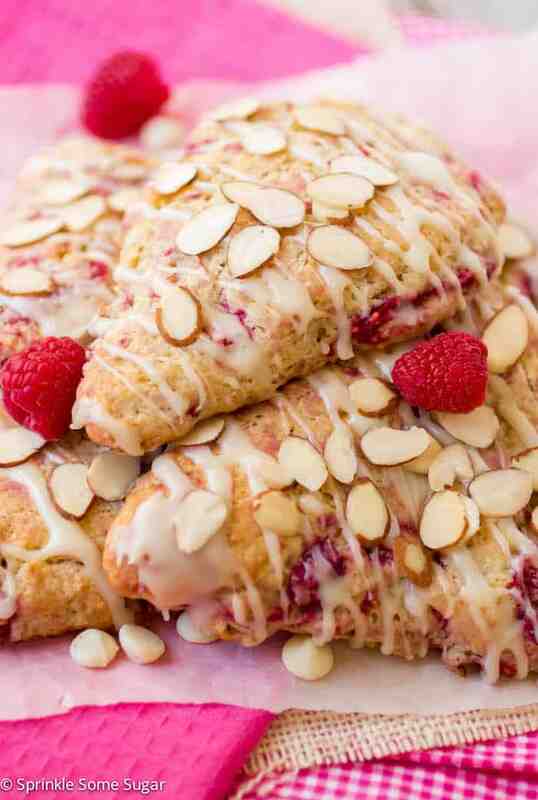 Almond flavored scones filled with juicy raspberries and topped with a white chocolate glaze and sliced almonds. Scones.. breakfast or dessert? I always feel like scones, just like cinnamon rolls, are alike in the sense that they can be served as either a breakfast treat or dessert. I enjoy scones for both and they go so perfectly with a side of tea or coffee! I used my favorite scone base (are you guys tired of my scones yet? I hope not. ), and tweaked it by adding a little bit of almond flavoring and fresh raspberries into the dough. One note about the raspberries – it is basically impossible to stir fresh raspberries into the dough without them smashing, but don’t fret! They will make the dough very sticky so make absolutely sure that you are patting it down onto a heavily floured surface and you’ll be in the clear with no issues at all. You can opt for frozen (unthawed) raspberries if you prefer, which I will probably do next time. Aren’t they beauties?! I love the pinkish-reddish raspberries peeking through and the almond dough paired with the raspberries is sooo delicious! I love raspberry and white chocolate together so when I saw some raspberries sitting in the fridge that needed to be used up and some white chocolate chips in the pantry, it was a given that I needed to incorporate them somehow. I drizzled a little white chocolate on top and while it was still wet, I sprinkled on some sliced almonds. You can even toast them for even more flavor. Make a batch of these scones, put on the kettle for tea and invite over some friends! Preheat oven to 400 degrees and set oven rack to the middle position. Line a baking sheet with parchment paper or a silicone baking mat and set aside. In a large bowl, gently toss sugar, flour, baking powder, baking soda and salt. Set aside. In a separate small bowl, whisk sour cream, egg, vanilla bean paste and almond extract until completely smooth. Set aside. Grate frozen butter into flour mixture. Using your hands, work in the butter until the mixture is crumbly. Gently stir in sour cream mixture until just about combined. Carefully stir in the raspberries. Note: If using fresh raspberries, they will smash, just work carefully and try not to over work the dough. Gently press the dough against the sides of the bowl a few times and form a ball. The dough will be sticky if using fresh raspberries. Place dough on a heavily floured surface and lightly pat into an 8" circle about 3/4" thick. Use a very sharp knife to cut into 8 triangles (like a pizza). Transfer triangles onto prepared baking sheet in a circle shape or in two rows (4 in each row) leaving about 1" between each one. Bake scones for 15-17 minutes or until the tops begin to golden. Don't take them out too early or they will be too soft. Allow them to cool for 10 minutes on the pan before transferring onto a wire rack to finish cooling completely. During this time, prepare glaze. In a small bowl, melt white chocolate chips and cream in the microwave at 30 second intervals. Be very careful because white chocolate seizes up very fast. Once scones are completely cooled, go ahead and drizzle the glaze on top with a spoon as pictured. 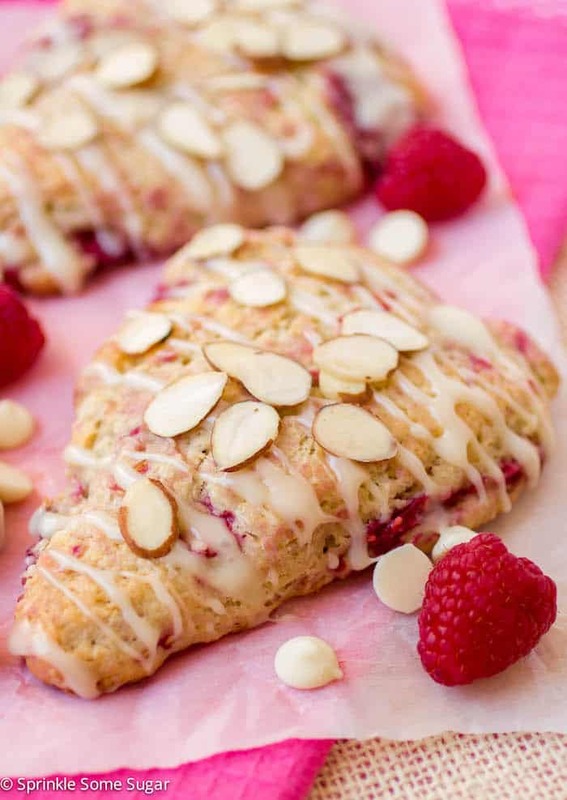 White Chocolate Raspberry Almond Scones will stay fresh for up to 6 days stored in an airtight container at room temperature. I don’t know how ANYONE could get sick of scones… especially these because they’re gorgeous! And the combination of raspberries and white chocolate with almonds? On point! Like you, I’m a scone fan for breakfast or dessert or an afternoon snack if they’re just lying around. I’ve pinned this and cannot wait to make it! Right?! I think I may have an obsession with scones lately. Haha! Thanks Erin!! These are some really beautiful scones! They scream delicious! Oh my goodness these are so pretty!! White chocolate and raspberry is always a winning combo! I’d happily eat these for dessert anytime, preferably with a cup of hot tea to wash them down. They look fantastic! I love all the flavors in this scone! And white chocolate glaze makes it perfect! Oh man I wish I had a dozen of these for breakfast and dessert! They look amazing! These look amazing. I really want to make them. What do you mean by grate the butter? Like use a cheese grater?